But climate and energy policy is also in the mix. The government had been planning to extend the life of Germany’s ageing nuclear power stations, in order to avoid the need either to build more coal, or to massively expand expensive renewables. This policy has been very unpopular with a section of the greener-than-elsewhere German public, and support for the Green Party is now reaching record levels (above 20%), to the point where they could be the senior party in a coalition with the social democrats. Then came the earthquake, tsunami and the Fukushima crisis in Japan, and Merkel immediately reviewed the nuclear phase out and has now called for a “measured exit” from nuclear power, pledging instead “to reach the age of renewable energy as soon as possible”. The volte-face is clearly driven by electoral calculation as much as anything else, although I’m not sure how many people will switch from green to CDU as a result. But the interesting thing to watch now is how sustainable this radical and costly policy will be now (although of course the nuclear route would also have been expensive). There’s a possibility she can make it work – Germany has one of, if not the greenest electorate in the world. 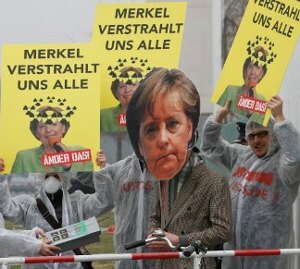 But there will be opposition – Merkel was heckled as she made her announcement in the Bundestag yesterday. Elsewhere in Europe Red-Green coalitions promoting radical policies have not done well. We are about to see how green Germany really is. Fine words butter no parsnips. Just because she wills a renewables based future doesn’t mean that it is possible to bridge the energy demand gap. There will be more deaths in Japan from the loss of electricity from the renewable sources that were taken out by the ‘quake and wave than from the loss of Fukushima. I was fascinated to hear an academic who’d studied the impact of Chernobyl. Aside from the immediate deaths from standing on top of the reactor with no protection, the most significant cause of mortality was from uptake of radioactive iodine by young children whose milk wasn’t being monitored. There’s a big risk (sic) of a non-rational decision to dump nuclear fission causing the deaths of millions through reduced economic development, accidents in gas and coal power generation (currently needed for the backup to renewables), etc. It seems to me that it matters not now whether there is a rational argument for or against nuclear. The damage to public opinion is not being caused by those dastardly greens and their cunning lobbying strategies and public communications, but by the daily blast of awful news from the perhaps aptly named Fukushima. You can muster all the evidence you like, but I’m willing to bet that come the next opinion poll in the non earthquake-prone UK, where Tsunamis hardly ever happen, we will see a significant undermining in people’s confidence in nuclear power. That’s what I meant by “non-rational”. I even heard (or maybe misheard) David Spiegelhalter implying that it is more sensible to make decisions based on the collective emotional response, rather than to debate based on agreed data. It seems to me morally wrong that we (through governments) overspend on some types of safety and underspend on others – if the ‘correct’ rate of spending is to use the expected impact on people, rather than just their initial emotional response. I find it hard to justify condemning unidentified individuals to deaths from car accidents by ‘saving’ others from train crashes. Your bet is safe, I’m sure. But I don’t think it inevitably so. Surely commentators should get people to act rationally?